AUTOMATIC MACHINES FOR MAKING SPRING WASHERS are designed for the manufacture of single-fillet spring washers with internal diameter of 3 to 8 mm out of wire of square and trapezoidal section. 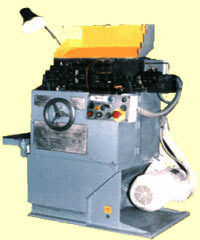 AUTOMATIC MACHINES FOR MAKING SPRING WASHERS are easily maintained, constructed for longterm operation. for the washers of trapezoidal section - steel wire with an ultimate strength of 700 MPa.